Look past the odd title and get your hands on a copy of Alice Medrich’s Chewy Gooey Crispy Crunchy: Melt in Your Mouth Cookies. Yes, it’s yet another all-cookie cookbook, organized around the textural qualities described in the title–but it’s not a rehash of too-pretty-to-eat, overly styled, bite-sized sugar bombs intended for kiddie birthday parties. Rather, Medrich applies her creative energies to tweaking the usual suspects from biscotti and sugar cookies to florentines and brownies. If you’re the sort of cook who delights in subtle variations and recipe change-ups, you’ll love this book. Medrich employs flavor-dense ingredients (think candied ginger, cacao nibs, espresso powder, garam masala, large-flake dried coconut, quality chocolate, toasted nuts) to deliver grown-up intensity throughout the book. 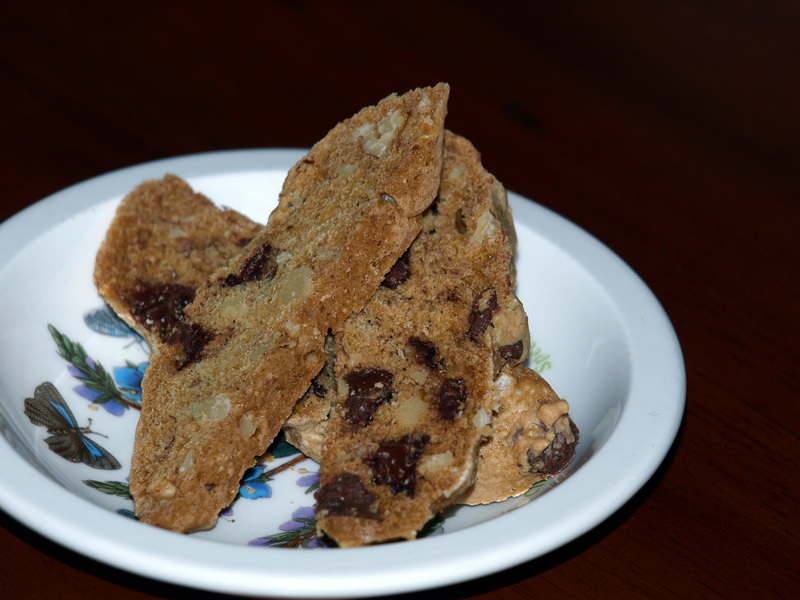 Her “Less Fat” biscotti (pictured above) live up to the “Crunchy” of the book’s title, suitable for dunking in coffee or milk. The biscotti will stay crisp for weeks, sealed in an airtight container. The nearly fat-free batter is a Toll House cookie cousin, with the butter removed. Chocolate is the star here, so use quality bittersweet chips from Guittard (my favorite) or your favorite bittersweet bar chopped into bits. Heat oven to 300 degrees. Line two cookie sheets (or one half-sheet pan) with parchment. In a small bowl, combine flour, baking soda, salt. In a medium bowl, combine eggs with sugars & vanilla until thoroughly blended. Mix in the nuts and chocolate chips. Batter will be sticky. Use a spatula to scrape the batter into two long, skinny, evenly shaped mounds at least 15 inches long, separated by at least three inches (or on separate cookie sheets). Bake for 35 minutes, remove from the oven, and cool for 10-15 minutes. Carefully lift each cookie log from the baking sheet onto a cutting board. Using a serrated knife, cut 3/8″ wide slices at an angle from cookie logs. Return biscotti slices, cut sides up, to the parchment-lined baking sheet(s). Bake an additional 20 to 25 minutes, until lightly golden brown. Cook on racks before storing in an airtight container. I’d never thought to make biscotti- you made it sound so easy!